This may or may not be an actual fact but my son told me this the other day and he’s working on a philosophy minor in college so I kind of trust him- kind of. When he was born, Plato was named after his grandfather, Aristocles. The legend is, he became a wrestler and his coach named him Platon which means broad. His shoulders and body were large and thus the nickname. It stuck and became shortened to Plato. There is another school of thought that the name came from the fact that he had a breadth of knowledge and eloquence or because of his very wide forehead. I find this all very intriguing and kind of fun. If you give up, let me know and I’ll point him out to you. This is fun. Guessing here — the guy in the blue. I thought maybe the guy in yellow or orange to his left but he looks more like he’s packing weight than that he’s just big. I’ll watch for what others think and your answer. Glad you liked it, Lavada. Good guess but he’s the one in the coral. Near the center. Although the guy in orange has a big head. Lol – my son knows who they all represent. I’ll ask him about blue guy. I think that may be Aristotle. Yes, the guy in blue is Aristotle- he is pointing to the ground and Plato is pointing to the sky because of their philosophies. Plato deals with what is what’s beyond life and Aristotle deals with what is in life. All this per the resident philosopher. Raphael painted this – he used Davinci as the model for Plato. Raphael also painted himself into the picture. He’s on the right side as you look at it. Near the bottom in the front (except this picture I took is only a part of the thing so you can’t see Raphael in it). Thanks, this really has been a fun fact. cool. Courtesy of the kiddo! Next week’s should be as well. It is a toga – lol. And you are correct on the one he is. Well done. You pass the FF exam. How interesting…and the fact that your son is a minor in philosophy…I love that! I have a story that I’ll not take up your post with, but I think your son’s choice is great. What fun! 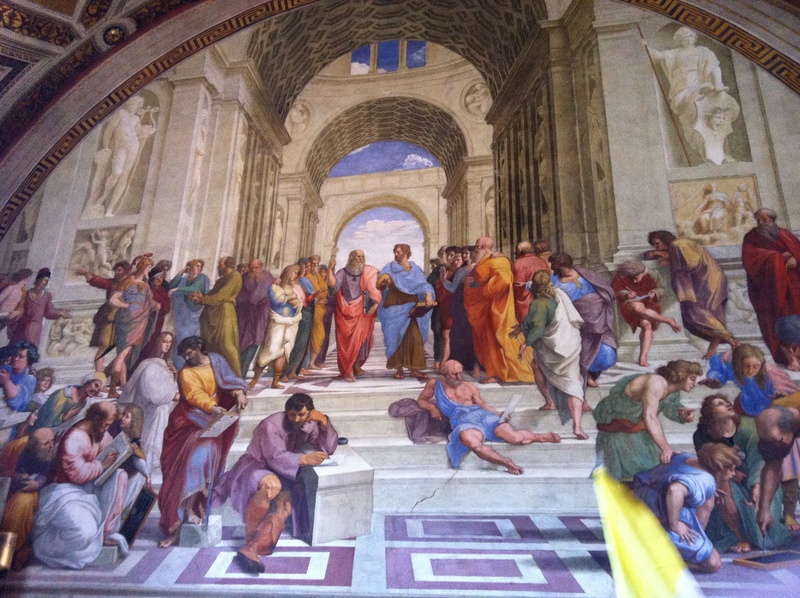 I guessed wrong, guy in blue, but I see Plato pointing upward now. Guy after my own heart! lol. Love that Plato is your kind of guy.